The music of Saala Khadoos is a mixed bag, feels Aelina Kapoor. R Madhavan plays a 'khadoos' (boorish) boxing coach in Saala Khadoos, and composer Santhosh Narayanan and lyricist Swanand Kirkire have made a soundtrack around it. 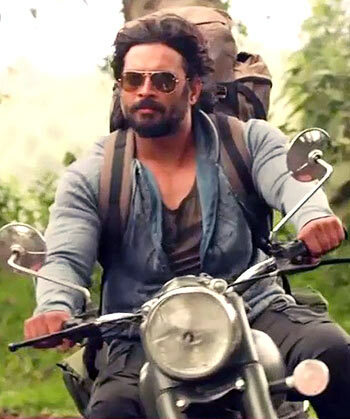 The title song Saala Khadoos is about the journey that Madhavan's character takes, while being on a backpack road trip. There are certain Rajkumar Hirani influences (Hirani produces this film) in the manner the song is put together. Singer Vishal Dadlani brings on the required flamboyance, and gives meaning to Kirkire's words. Sunidhi Chauhan lends her vocals to newcomer Ritika Singh in Jhalli Patakha. A catchy number about an uninhibited girl, living life to the fullest, this one has Swanand Kirkire letting his hair down as a lyricist. Santhosh Narayanan brings Monali Thakur on board for Dil Ye Ladaku. A song about the female protagonist discovering love and finding ways to express it to the man of her dreams, this one stays away from the mush zone and instead follows a light-hearted approach. Vishal Dadlani returns with Vijaynarain for the song Jagaa Khunnas. The song is the right character graph for the protagonist, who has been established as a 'khadoos' and is asked to bring on the same trait to take on the opposition with 'khunnas.' Musically, there isn't much in the offering here, but the lyrics take the story forward. The soundtrack concludes with Dhuaan Hai Dhuaan Zindagi, sung by Kalyani Nair. It describes the plight of the female protagonist, who wonders if she would be able to hold back her life all over again. It has been a while since we have heard a song like this. The music of Saala Khadoos is a mixed bag. While none of the songs will go all the way, a couple of them fit in well and promise a good narrative.